Paroxysmal supravevtricular tachycardia due to AV nodal reentry. Narrow complexes with ST segment depression are seen in the upper panel. 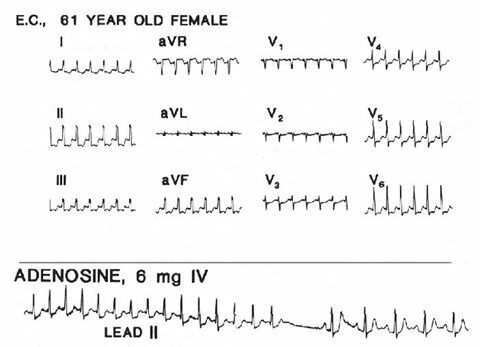 In the lower panel, adenosine, 6mg intravenously, terminates the tachycardia with immediate return of the ST-T WAVE pattern to normal.